Size of this preview: 800 × 546 pixels. Other resolutions: 320 × 219 pixels | 640 × 437 pixels | 1,024 × 699 pixels | 1,280 × 874 pixels | 2,934 × 2,004 pixels. English: Happy 2nd Lt. William Robertson and Lt. Alexander Sylvashko, Red Army, shown in front of sign [East Meets West] symbolizing the historic meeting of the Soviet and American Armies, near Torgau, Germany on w:Elbe Day. 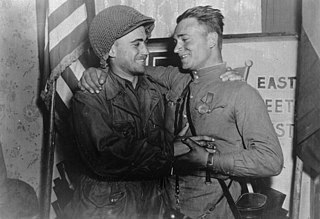 Deutsch: 2nd Lieutenant William Robertson (US-Army) und Leutnant Alexander Sylvashko (Rote Armee) beim symbolischen Handschlag "East Meets West" am 27. April 1945 in Torgau.